Hello duckies. I come to you with yet another pancake recipe. Wait don’t go! Have I spouted off at you yet about the marvels of teff flour? That it’s gluten-free, pretty much guaranteed gmo-free, incredibly delicious and easy to bake with? This recipe, which I yoinked and modified from Nourishing Meals, makes about ten good-size, FLUFFY pancakes. And they’re filling – I ate two in one sitting and was pretty stuffed; good news in that they refrigerate very well. I ate these for about a week. There is no such thing as too much applesauce. Now, I found this recipe because teff was on for cheap over at Bulk Barn and I’d scooped up a bunch of it, but I was out of bananas. 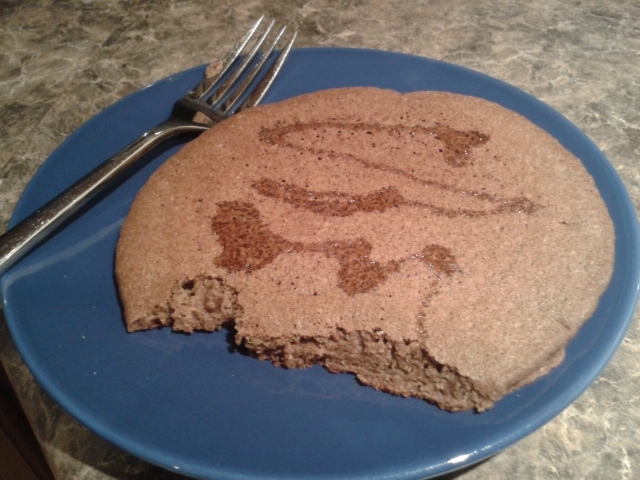 Most pancake recipes with teff also include banana, and it was so frustrating to sift through internet to find one that deviated. Luckily, I did. 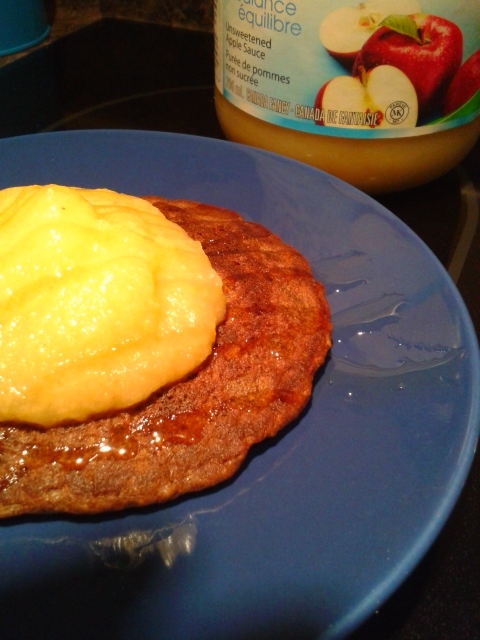 However, if you’re interested in a banana-teff concoction, head over to Nourishing Meals, because this recipe worked fantastic and I’m sure her banana one does as well. Alright, on to the nitty-gritty. For starters, heat your frying pan over medium heat – this is handy to melt the coconut oil in before adding it to the mix. Whisk the dry ingredients together in a medium-sized LARGE mixing bowl. I tried medium-size the first time, and it barely contained the mix; go big or go home on this one. Add the wet ingredients. Whisk together well. This is my largest bowl. Make sure your pan still has a little coconut oil on the bottom (just a little). 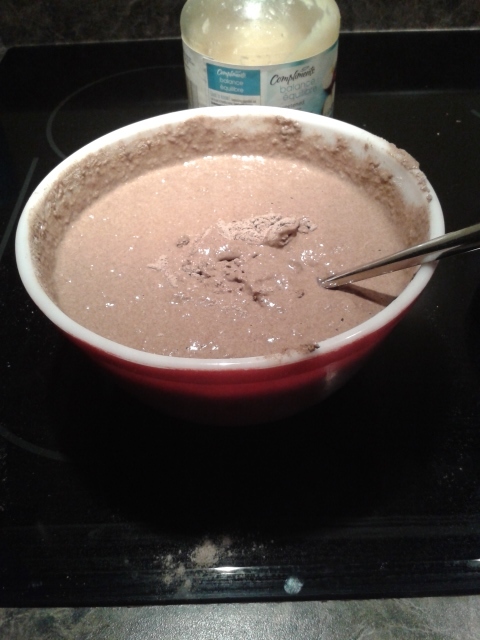 Use a 1/2 cup measure to pour the batter into the pan. Cook for 60 to 90 seconds on one side, then flip and cook for 30 to 60 seconds on the second side. Be warned – they can burn very easily. Part of the attraction of this recipe, for me, is that they cook quite fast. They’re spongy and delicious, especially with applesauce/apple slices on top, drizzled with honey. Or even just honey by itself. Now, lemme ‘splain you a thing about teff. Although, you could probably just read this Wikipedia page, but I shall summarize for those who do not wish to linkhop. Teff is a fine grain—about the size of a poppy seed—that grows predominantly in Ethiopia and Eritrea. It has a very mild, nutty flavor, and is an “ancient grain” – it’s over 5000 years old, and is not currently genetically modified. Teff apparently has an excellent balance of amino acids, and it is also high in protein, calcium, and iron. When ground into flour, teff is used to make traditional flatbread called injera, and is how I normally consume it at Ethiopian restaurants, though it’s rather sour and can be surprising at first. These pancakes were an all-around success, and I’ll def. be using teff in future baking. It’s like 30 cents per pound at Bulk Barn! Crazy! So good!